Flights were on American (several airlines were all at the same rate, picked based on time and connecting city) and we had no real issues. Car rental was through Hertz. Mazda 3, which was much less comfortable than the 6 I had last year. We’re pretty sure we got screwed a bit on the cost there and have no interest in dealing with Hertz again any time son. Hotels and food are all mentioned in the daily reports. I brought my own GPS. It worked fine for the most part, but had occasional issues with new construction and road names. The construction wasn’t a problem as it was obvious where to go but the names did cause some problems. We had to refer to the paper directions for several places as I couldn’t find them in the attraction list and the route number in the address wasn’t accepted (for some reason it wanted the local name). 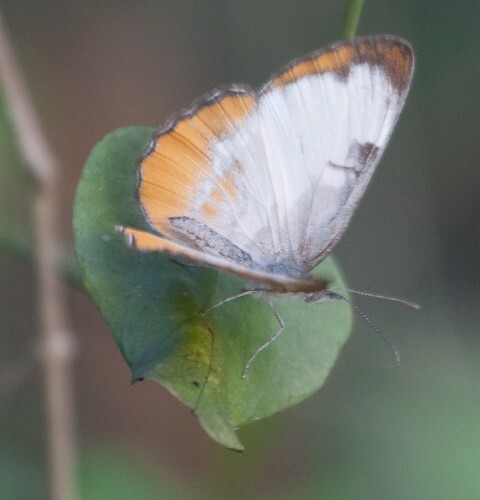 The cool and cloudy weather wasn’t very good for bugs, which were in low numbers after cold weather before we arrived. 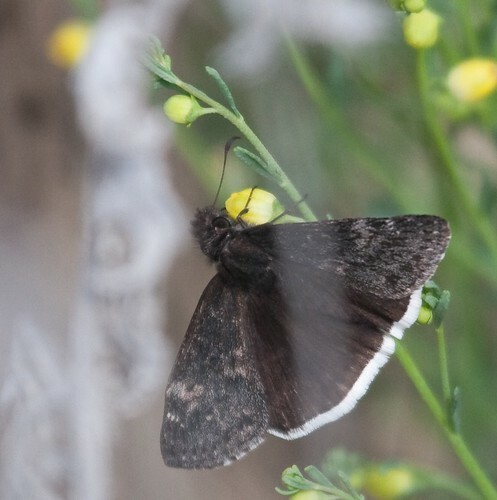 Presumably the duskywing at Falcon. Today was a travel day as we headed back to San Antonio. 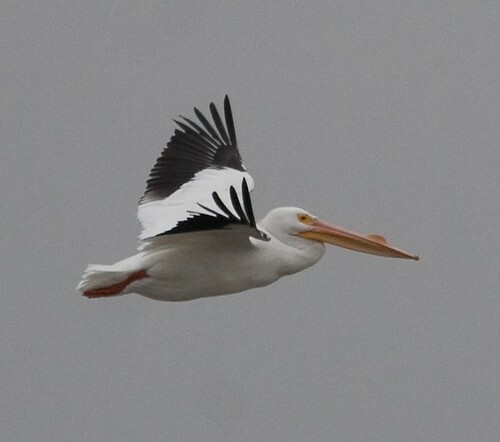 Of course, with 2 very good birds on the way, it was also a good birding day. We left Rockport and started towards Beeville. On the way, we found a couple Sandhill Cranes in a field and had an Avocet and other stuff fly over. 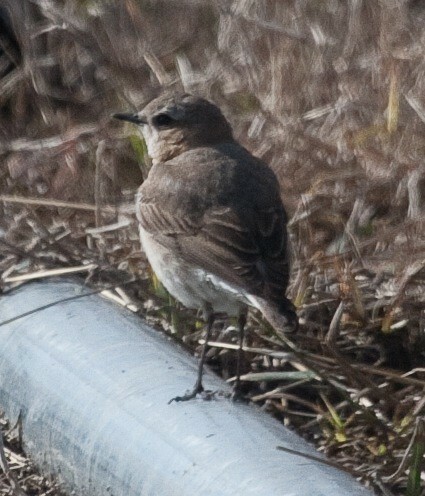 Reaching Beeville, we worked our way to the outskirts where a Northern Wheatear spent the winter at a farm. The farm was easy to find (a bit closer to the road than the directions implied). Getting out of the car, we were almost immediately joined by a Canadian couple. 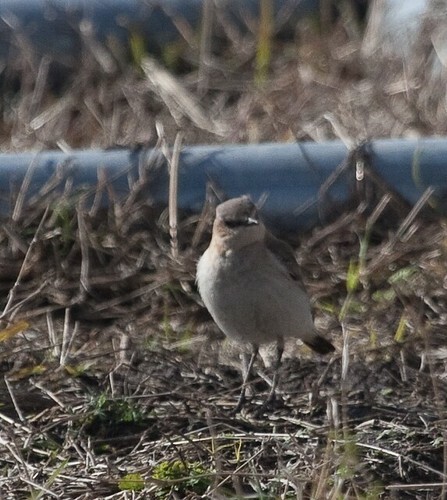 Seconds later, the wheatear popped up and gave us pretty good views (which was doubly nice as other people reported having long waits and only distant views). After stocking up on peanut brittle for gifts, we headed on to the next stop, Choke Canyon State Park. Not surprisingly, the other people were heading that way too and we arrived at the same time. Checking in, we got directions to the pond hosting the Jacana and headed that way. 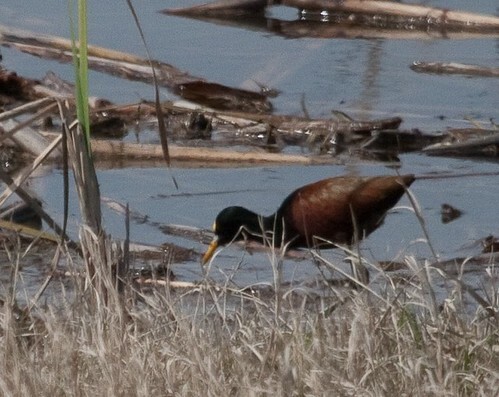 Almost immediately, we located the bird walking out in the open along the edge of the lake. 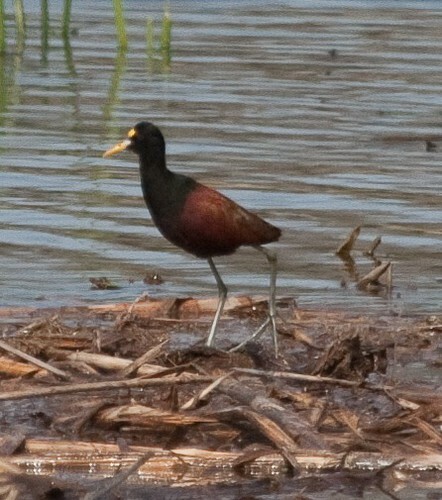 We spent close to an hour watching it walk and fly along the edge of the pond, getting great views. We drove around the park a bit and eventually stopped at one of the picnic areas for lunch. 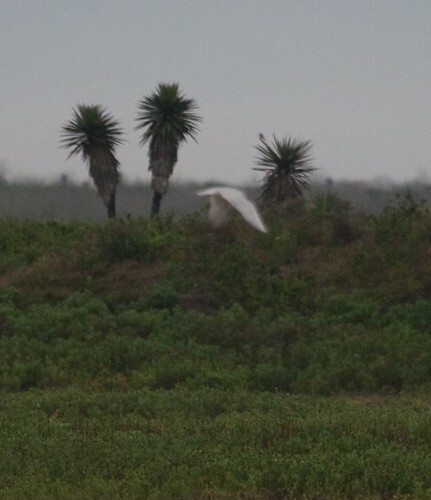 This was near the fishing area and we enjoyed a flock of Snowy Egrets waiting for leftovers. From here, we headed back to San Antonio, arriving at Jack’s midafternoon. We went out to Red Lobster for dinner (again with a wait from rodeo crowds). It was fairly good (especially considering we already had excellent seafood the last few nights). We then packed and got ready for our early flight. The return trip was easy with flights right on time (not having to get off the plane in Chicago was very nice) and we were home by midafternoon with Harry waiting. 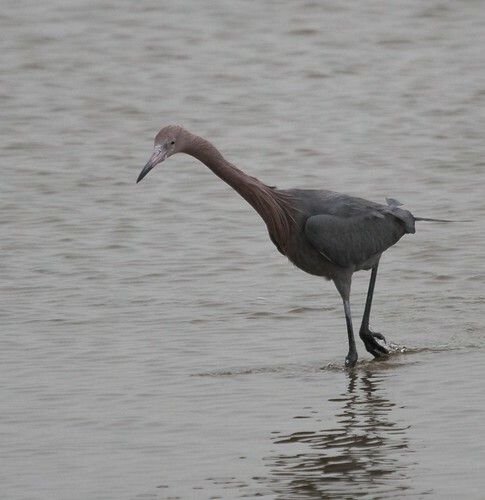 Today started with a trip to Aransas NWR. On the way, I noticed that the gas tank was a bit low (presumably from all the idling in traffic yesterday) but figured we were still fine. The road to Aransas is pretty long and there’s absolutely nothing on the way, but we got there quickly. 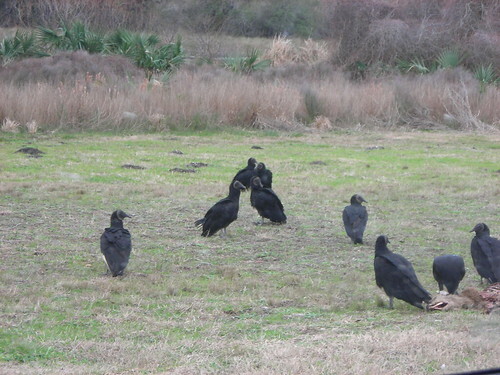 Entering the refuge, there were a lot of vultures on the side of the road (photo by my mother). After checking in, we headed straight for the tower. I missed the entrance and ended up walking out the boardwalk first. 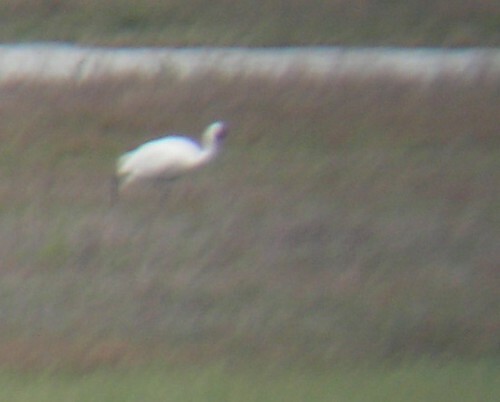 It was rather cold, but I quickly got a distant view of 2 Whooping Cranes, so mission accomplished. 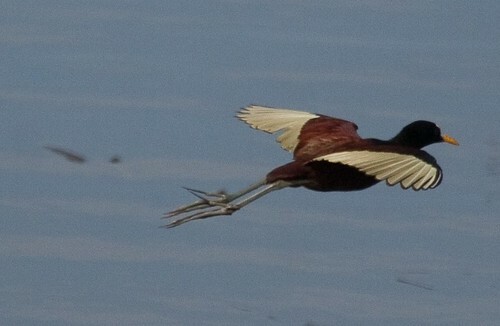 We continued to the end of the boardwalk, where a large number of herons and spoonbills were foraging. Finding the correct spot to climb, we headed up. Surprisingly, the wind was almost better at the top and I was able to vaguely digiscope the cranes. In addition, there was a White-tailed Hawk way out, and on the new overlook that had yet to pass inspection, a Turkey Vulture. Back at the car, we thought about the auto loop, but given the conditions and the fact that the car was very close to running out of gas, we decided to just head out and go elsewhere. That proved to be a smart decision as the gas light came on just before we got to a station. After filling up, we drove to a few of the spots on the birding trail loop without finding much. We then hit the grocery store and bought some roast beef for lunch, which we ended up eating back at the hotel. After eating, we headed back out and drove along the coast a bit before working our way to Goose Island State Park. 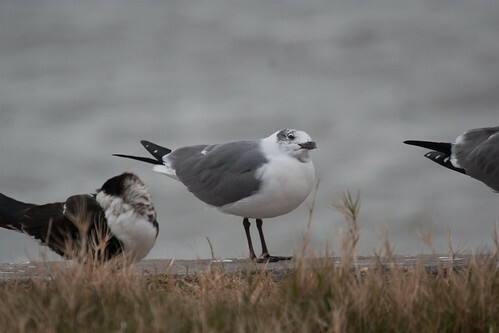 At Goose Island, we drove around a bit before stopping on the beach, where there were many skimmers and Laughing Gulls, along with a few turnstones. We watched those for a little while before driving around the rest of the park (and deciding that the trails were too wet to walk). We returned to the beach, where we found a few loons on the water (and I found a couple Eared Grebes way, way out). The gulls took a big interest in us when I attempted to peel an orange outside the car, to the point that I decided not to bother. After Goose Island, we headed back to the hotel. For dinner, we went to Captain Benny’s. It was very good, although a bit of a dive. Benny looked shockingly like a certain Massachusetts birder, although he sure didn’t run the restaurant with the same precision. Today, we headed to Laguna Atascosa. It was drizzly to rainy when we arrived and the staff were almost surprised that anyone showed up. Luckily it stopped enough to walk the trails near the visitor’s center for a few minutes. 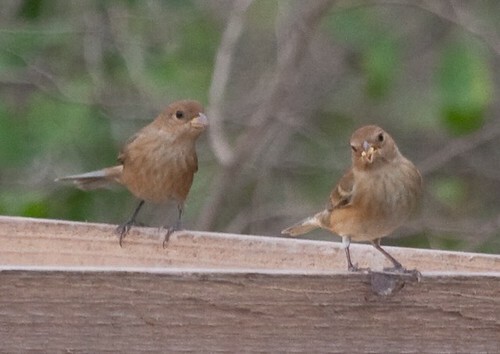 We didn’t see too much (unfortunately the Blue Bunting didn’t show up until a day or two later). Continuing around, we were passed by a couple cars and seeing more of the same. Eventually I saw something small pop up off the road. I pulled over and surprisingly was able to find it in the vegetation. It looked pipitish, so I pulled out the scope. 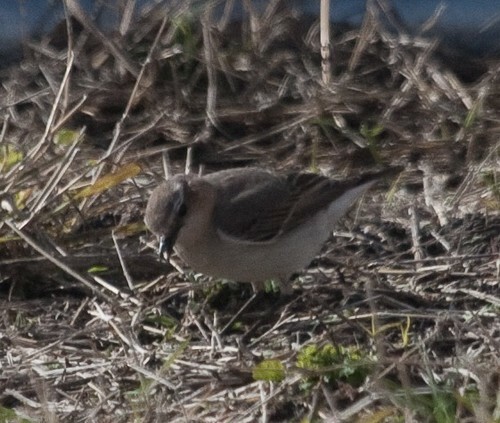 It flew again but I again managed to refind it and confirm the blank face of a Sprague’s Pipit. 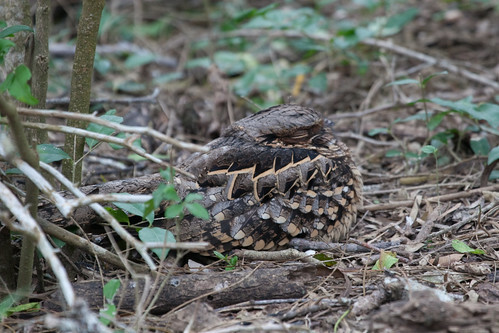 This was one bird that I was hoping for but not anticipating finding. 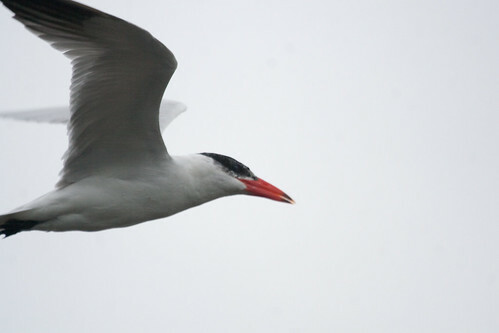 The area also had a few Gull-billed Terns flying around, of which I managed a couple marginal (for a marginal definition of marginal) photos. 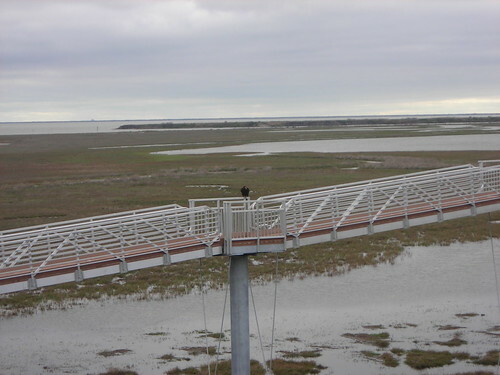 Completing the loop, we drove to the observation platform and trail. It started raining a bit, but we walked down the trail to the pond. The water there was almost over the platform and the only bird on the water was a Least Grebe. Getting back turned out to be a muddy mess. From here, we began the long drive to Rockport. Before really getting going, we did get a fairly decent look at a perched White-tailed Hawk. The drive was fairly quiet (and rainy off and on). 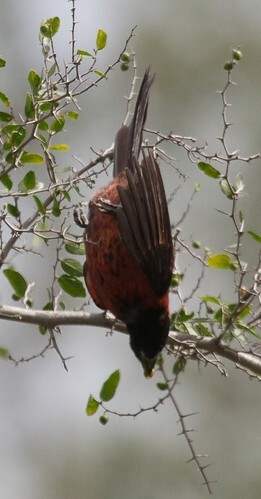 A stop at the Sarita rest stop had more than a couple Brewer’s Blackbirds, another overdue lifer. Instead of taking the camera, I decided to drive up to the flock and get some pictures on the way out. Of course, the birds took off in by the time we did so. Other than a big traffic jam near Corpus Christi (which was stop and go for probably 40 minutes, note this for later), we didn’t have any major issues and reached Rockport (or Fulton), where we got a room at the Best Western for the next two nights. Dinner was at Charlotte Plummer’s (which took a bit of work to find with the road being dug up). The food was excellent, especially the shrimp gumbo (thanks for the recommendation Paul). We started today at Estero Llano Grande. There’s a Wednesday bird walk and we arrived just in time to join. It was rather cold and windy, which presumably kept crowds down. In fact, there were only 2 others on the walk and five park staff/volunteers. Lots of good stuff from the deck included all 3 teal, some Mottled Ducks, and many Black-necked Stilts. We started down the trails and spent some time waiting for some scaup to stop sleeping (which they did, proving to be Lesser). The cold got to me (and my father) and we ended up running back to the car for jackets. Passing the feeding station, I found a Ruby-throated Hummingbird and then a big flock of Cedar Waxwings dropped in. The host was quite excited when I mentioned them once I rejoined the group, apparently they’re not very regular down in the valley. 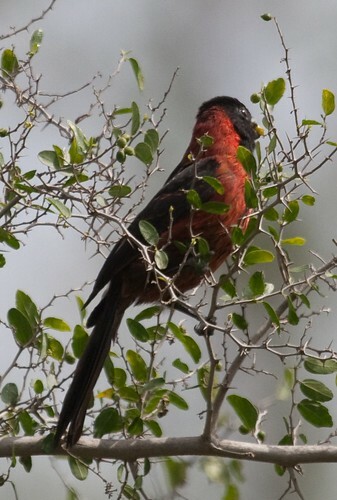 We rejoined the group at the Pauraque stakeout, with one very obvious bird. 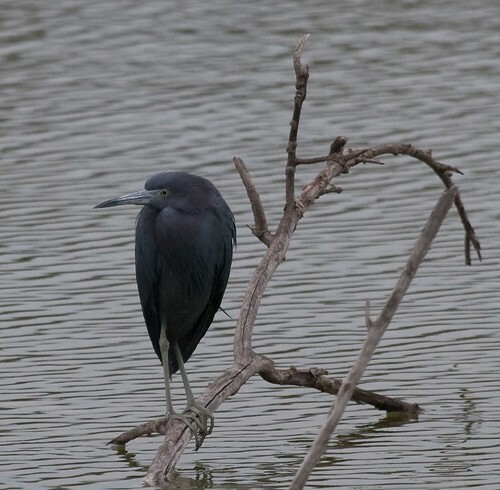 At Alligator Lake we had a variety of herons including Black-crowned Night-, Little Blue, and Tricolored. 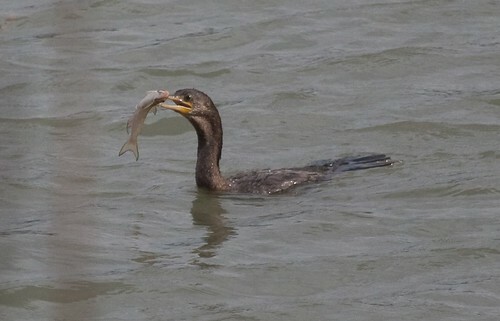 There were a few Anhinga around and a single Nutria. We moved on to the uphill portion of the park. After being warned that the wind would be bad, it turned out to be no worse. 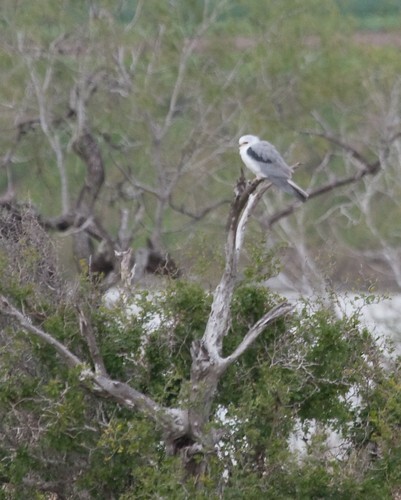 The White-tailed Kites sitting nearby and the huge flock of pelicans coming in helped. 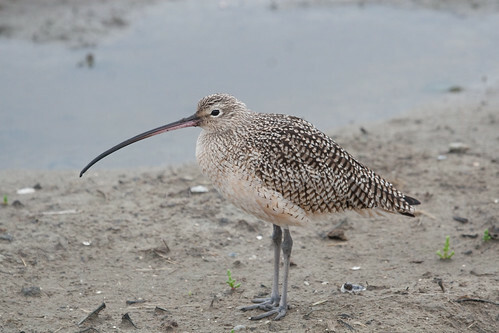 As did the stilts and avocets and huge number of shovelers. Once back downhill, the other people had to leave, which left us with a personal tour. 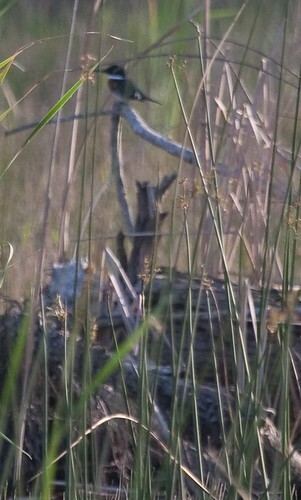 We continued around the pond, finding a (presumed) Tropical Kingbird among other things. I spotted a whitish bird coming over the wooded area and after getting bins on it, the crazy bill revealed it to be a Roseate Spoonbill. Not quite the view I hoped for, but (pending a couple others) this was #500! Finally. We worked our way back to the visitor’s center and then decided to head out after spending a few minutes at the feeders. The next stop was Frontera Audubon, which was only a few minutes away. After checking in, we headed down the trail and found the feeding area. Settling in, we enjoyed the large number of Inca Doves and an Ovenbird. Eventually, a large group came in and we got ready to move on. Luckily, right before we did the Tropical Parula put in a very quick appearance. We walked the rest of the trails, getting lost a couple times. It was fairly quiet, with the main highlights being a large number of perched Turkey Vultures and a Green Kingfisher. We ran into the large group again, who were as lost as we were but eventually we made our way back out. Next stop was the Wendy’s up the street for lunch and then we began the ride to the coast and South Padre Island. On the way, we got minimal views of White-tailed Hawk but not a whole lot else. At South Padre, we went straight to the boardwalk. I probably should have dragged the scope but there was enough close stuff to not care too much. 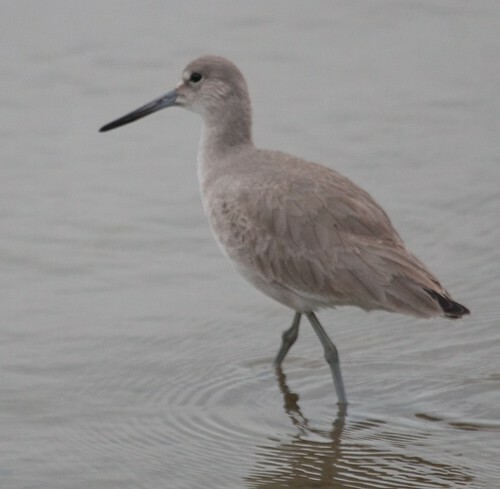 Highlights included an active Reddish Egret, a couple Long-billed Curlews, a nice close Spoonbill, many Black Skimmers, and several Caspian Terns (a very overdue lifer). 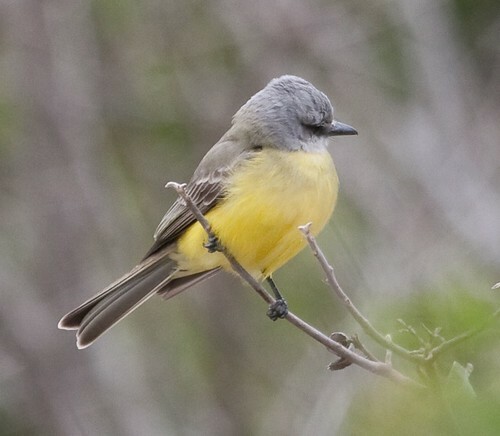 A presumed Couch’s Kingbird was nice as well. On our way out, we asked the person behind the desk and the cashier about places nearby for food. They gave us several recommendations but when we said we were from Massachusetts, the cashier started telling us how much she loved our new senator. The other staffer tried to get her to move on but she didn’t take the hint. I have no idea why anyone dealing with tourists would think politics was a reasonable subject for conversation. We ended up staying down the street at a Days Inn, which was perfectly acceptable (other than the supermarket donuts for breakfast). We walked to Blackbeards’ for dinner (apparently named after multiple people), which was quite good. 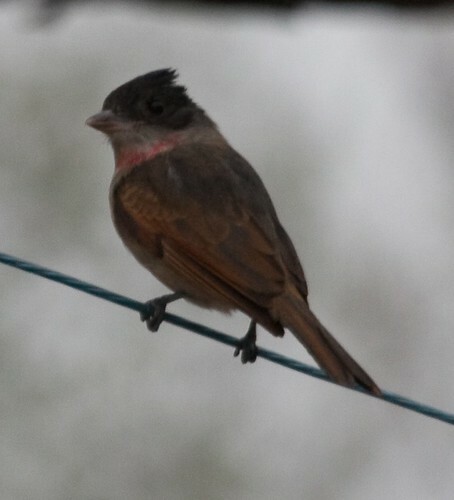 Today got off to an earlier start as we wanted to be at Bentsen for the 8AM feeding as the Rose-throated Becard was most regular at that time. We arrived a few minutes before 8 to find the visitor center closed. We went to the self-pay station and were walking in when the volunteer at the gatehouse started yelling at us to go back. Apparently the self-pay and the new wristband regulations haven’t quite synched up but eventually we got things straightened out. We sat down outside the gatehouse and were told that the becard would likely be in as soon as the food was brought out. I looked up and it was sitting there waiting. 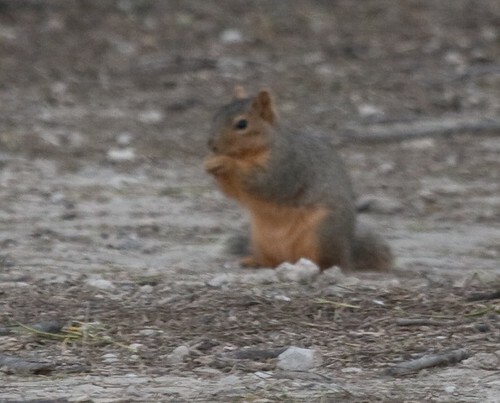 Unfortunately it was too dark (and windy) for photos and the ones that I took were blurred to the point of showing two birds. 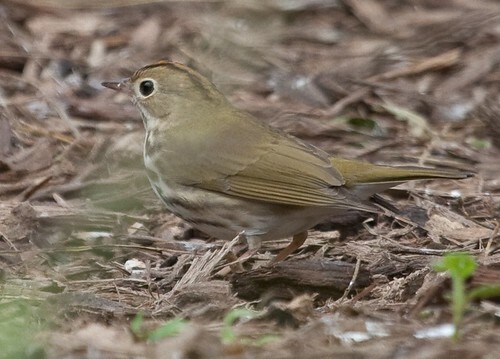 We continued to watch the show and soon had a Clay-colored Thrush pop in. By now a crowd was assembling and the bird walk was due to arrive at any moment, so we headed into the park. At the next set of feeders, a single javelina was feeding. We spent a few minutes watching as it was one of the things my father most wanted to see. Moving on, we got to the boat ramp and found the wind to be way too much to be anywhere in the open. We quickly went to the blind. There were plenty of birds coming in to the water here including several orioles, White-tipped Dove, a Golden-fronted Woodpecker, and a Rose-breasted Grosbeak. 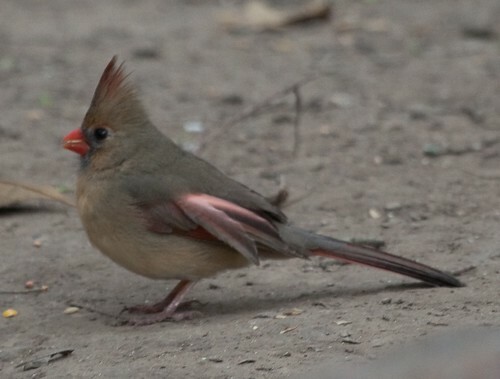 There was also a female cardinal that had a couple loose feathers, showing the pink base to them. We then walked out to the hawk tower (stopping at the Forbes’ Silk Moth sign). It was too windy to stay at the tower, so we started to walk back. After a bathroom stop, we checked the Acacia Trail feeders and watched a Blue-headed Vireo, an Olive Sparrow, and several buntings. We worked our way out (stopping to check the feeders and not finding anything different) and headed off to our next stop. 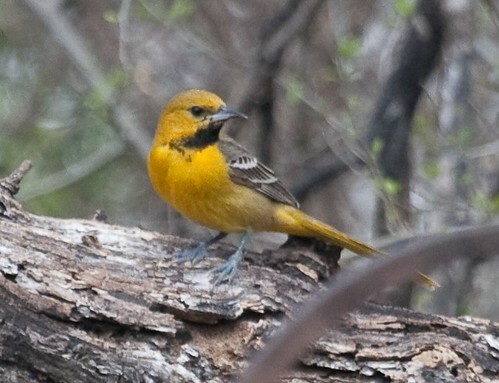 It was only about 20 minutes to Quinta Mazatlan, home of the Crimson-collared Grosbeak. After mistaking the bathroom for the office, we got vague directions to the bird and headed to the amphitheater. 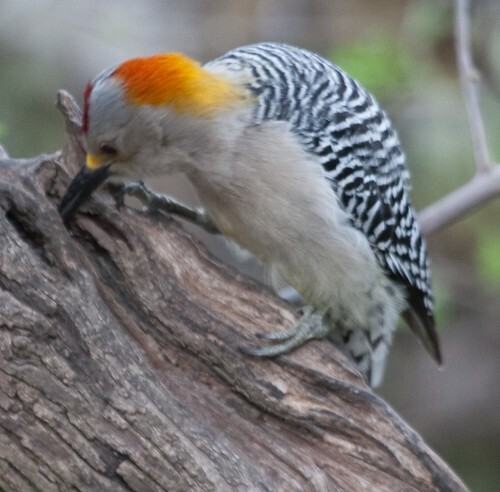 The first person there said they hadn’t seen that but there might be a Ladder-backed Woodpecker around. I took that as a sign that we may need more directions and went to pay the admission and find out exactly where the bird was. The person at the desk told us that it has been hanging out by the pond. We headed over and sat down (after realizing the water feature the size of a birdbath was actually the pond). 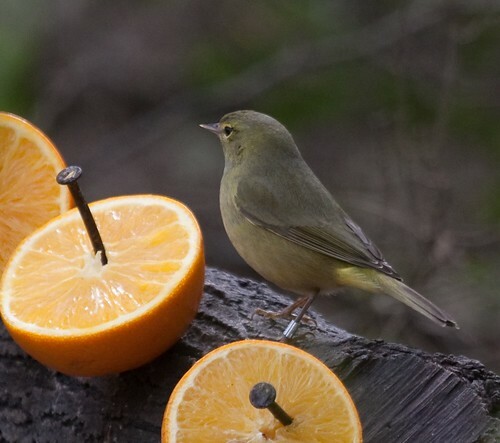 An Orange-crowned Warbler came in to the oranges but there wasn’t much else around (an Accipiter passing through didn’t help). 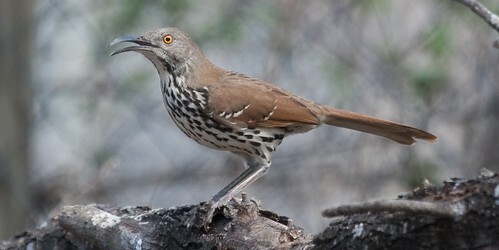 I eventually started wandering around a bit and found a Curve-billed Thrasher. When I went back, I found someone telling my parents that they have no idea why the desk keeps sending people here and that the bird is towards the other end of the estate. We started to head over (I made a stop for a thrasher photo first). We reached the spot and found out that the bird had just disappeared. After giving it a few minutes, we started to wander the area a bit figuring that it was looping around. No luck with that, but my mother found the Tropical Parula while off by herself. I eventually started to loop around again and was halfway through when my phone buzzed with a missed call. I figured the bird must be there and started to pick up the pace. My phone buzzed again and I got there in time to see the bird as it buried itself deep in a bush. Fortunately, a few seconds later it popped up and sat in the open briefly. Absolutely stunning, an incredible shade of red. The bird dropped back into the bushes and disappeared. 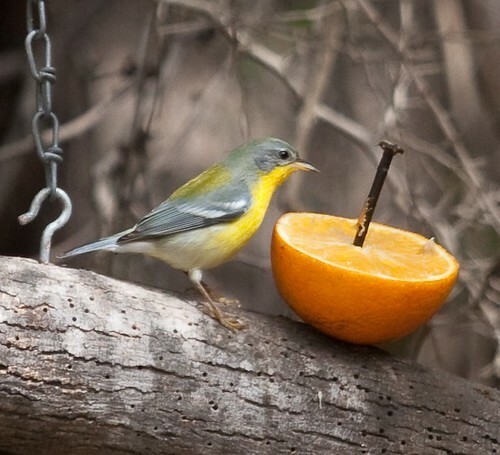 With the bird gone, we turned to the oranges that the parula had been frequenting, which were all of 30 feet away. We sat down and before long had been joined by about ten people. Ten minutes after arriving the bird dropped in for a brief visit. 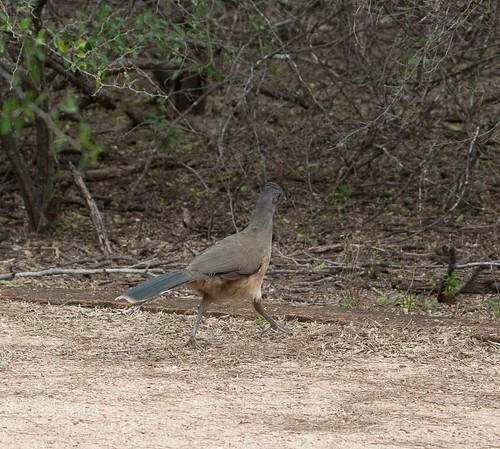 With both targets recorded, we headed off for lunch after a quick stop for the Curve-billed Thrashers. I forget exactly what we did for lunch, but McDonald’s sounds right. After lunch, we tried a couple spots on the birding trail list, neither of which was worthwhile. Eventually we ended up at the Valley Nature Center. 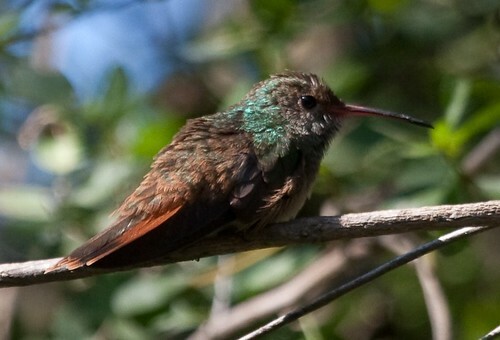 At the center, we wandered around a bit before sitting at the feeding station, which had several Buff-bellied Hummingbirds around, some of which actually posed. We walked all of the trails, which were fairly quiet (Black-and-white Warbler, several Tropical Checkered-Skippers) but it was relaxing. Eventually we headed out to find a hotel. The GPS said there was a Best Western right up the road, so we headed there. 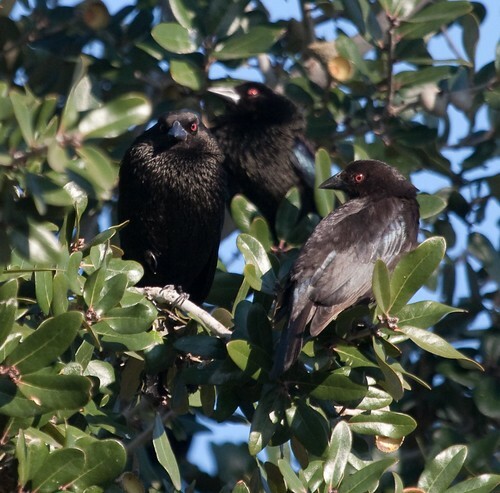 I sat in the car while my parents got a room and ended up finding a Peregrine, several Eurasian Collared-Doves, and a bunch of Bronzed Cowbirds. I also attemped to record some of the Great-tailed Grackle flock although I haven’t checked the quality of the recording yet. Dinner was at Chili’s, which was surprisingly good. Tomorrow: Estero Llano Grande, Frontera, and South Padre Island. Today we started by driving around Zapata a bit but never quite found the seedeater spot (and I didn’t really care so didn’t look too hard). Eventually, we headed off to Falcon State Park and arrived at about 9:30. After checking in and finding out the staff didn’t know much about the Roadside Hawk, we began to walk the nature trail. 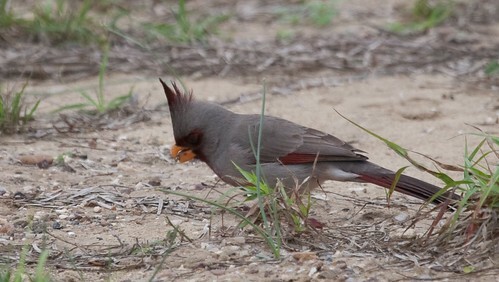 Before entering the trail, we had many Pyrrhuloxia and a bit of a surprise: a Cassin’s Sparrow which was a life bird for me. 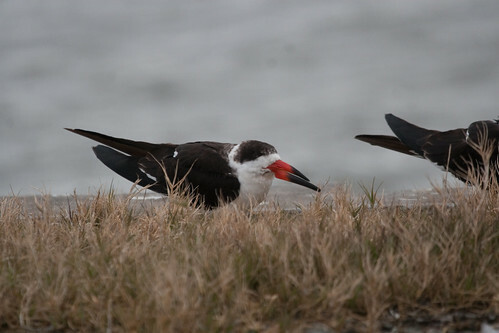 We then drove around a bit finding a Harris’s Hawk and not much else, so we headed for Salineno. There were actually people around this time and the bird show was a bit better. We sat for an hour and had all the expected birds including 3 species of oriole (Altamira, Audubon’s, and 3 different Hooded), 4 doves (White-tipped, White-winged, Inca, and Common Ground-), Ladder-backed and Golden-fronted Woodpeckers, Olive Sparrow, Long-billed Thrasher, and Black-crested Titmouse. 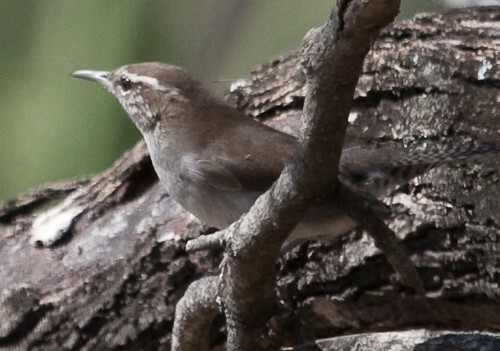 I also enjoyed a Bewick’s Wren. Once we had our fill, we went and scanned the river for a couple minutes and then headed towards Mission. Lunch was at a Whataburger, which was a decent fast food burger but nothing extra. After eating, we realized we still had a lot of daylight left, so I decided to head to Santa Ana. The GPS refused to pick up the road names we had, so it took a bit of effort to get there, but we arrived seconds before the visitor center closed. We walked some of the shorter trails (I’m actually not sure which one, I got a bit lost). 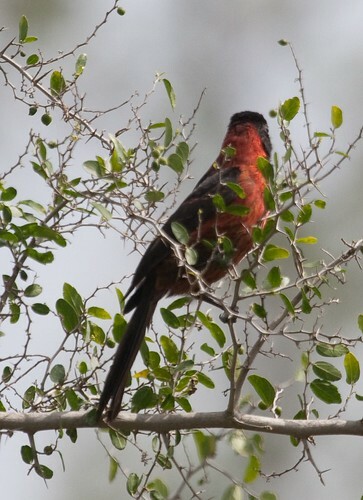 Besides the scenery, we enjoyed several Chachalacas, more Olive Sparrows and Black-crested Titmice and perched Red-shouldered and Harris’s Hawks. On the water were many coots and moorhens, along with several Least Grebes and many ducks including a couple Mottled. 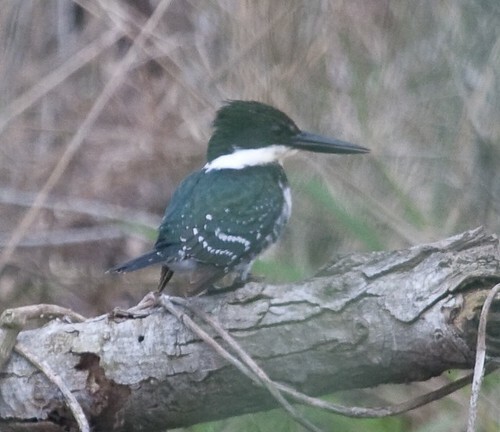 Way out, we found a Green Kingfisher. From here, we went looking for a hotel (another Ringed Kingfisher flew across the road in front of us) and ended up at another Holiday Inn. Better than the one the night before at least. The person at the desk recommended a Mexican restaurant that we were able to walk to. It was called Antojito’s and was slightly above fast food but very good. I don’t think any of us actually know what we had to eat but it was all tasty so we didn’t care. Tomorrow: Bentsen, Quinta Mazatlan, and Valley Nature Center. Today was mostly a travel day. We left for the airport a little before 6. Other than the taxi driver being too busy talking to actually get on the pike, no issues getting to the airport and then getting through security. Both my mother and I got patted down and I had my boots taken for extra scanning (they were back by the time I got my wallet and watch and stuff back together so it wasn’t even a slight inconvenience). The flight to Dallas was right on time (after some initial delays while they fixed the coffee machine). We had just enough time to grab food before the brief flight to San Antonio. Our bags were off the baggage claim quickly and it didn’t take too long for the rental car (though upcoming logistics post). 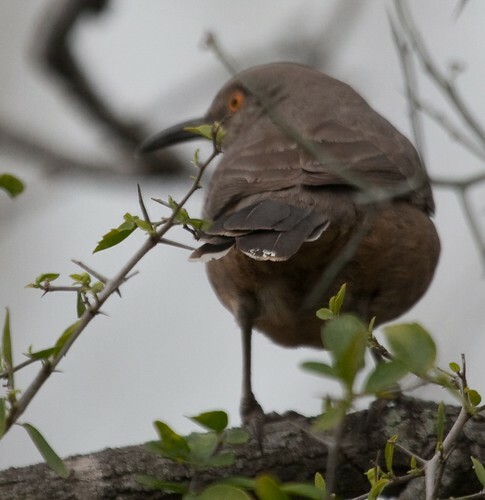 First birds were Great-tailed Grackles waiting for the shuttle. Like last time, I got a bit lost leaving and ended up circling around a little bit before I found the right highway. Ten minutes later, we pulled up to our friend Jack’s house. After a few minutes to relax, we headed out to get a tour of San Antonio. After a bit of driving around, we went to walk around the riverwalk and some nearby areas. We parked on a fairly empty street, put a bit of time on the meter, and started off when a truck with some sort of tourist board logo stopped. A woman hopped out and told us that there were lots of break-ins to cars in the area. We immediately got back in and moved to a parking lot. The riverwalk and surrounding area was fun, it reminded me a lot of the Faneuil Hall area but with a southwestern feel. We stopped outside the Alamo for pictures and then ended up walking through. It was small but more interesting than we expected. After checking out a nearby indoor market, we decided to head to the Outback near Jack’s house for dinner. We ended up getting completely lost on the way back to the highway and I had to pull the gps out to get us back. Once at the restaurant, we were told the wait was about an hour (it was rodeo week). I think it was closer to 40 minutes. The food was decent as expected. 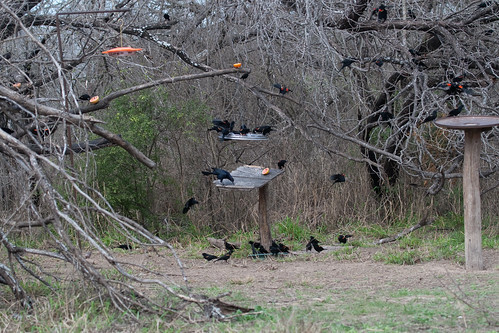 There was a big grackle roost right outside the restaurant and the noise was quite entertaining. A short ride back and we were ready for bed. Today started with a leisurely start. After breakfast, we went to the grocery store (an HEB) for snacks and other supplies. Jack then took us on a walk around his neighborhood. 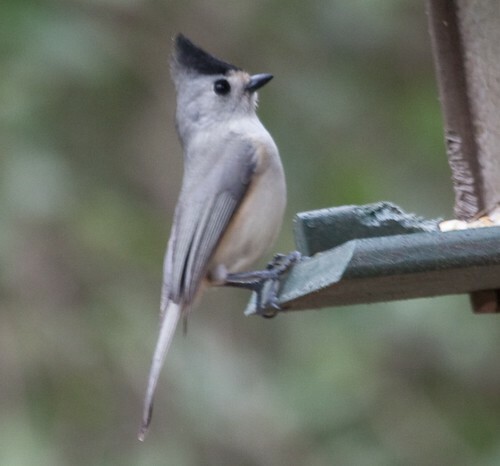 There were quite a few birds around including a presumed Golden-fronted Woodpecker and my first Texas Blue Jays, American Robin, and Cedar Waxwings. A little before noon, we loaded up the car and headed south. I had originally planned to head for Aransas first and then work our way south but with the Amazon Kingfisher report, I decided that we were better off heading for Laredo and looping around that way. Our first stop, however, was off the highway in Frio County. 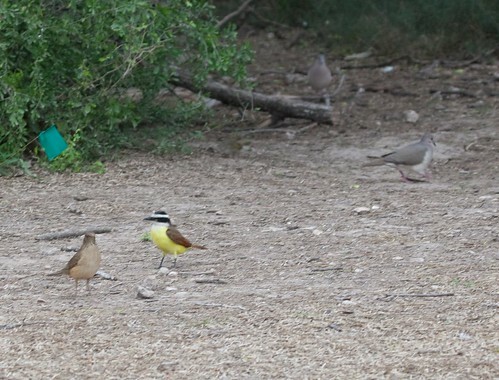 Mountain Plovers had been reported on TEXBIRDS and they appeared to be not too far off the route. Just when I thought we had managed to miss the turn, we found highway 57. The first field was a few miles down but the birds were supposed to be distant and we didn’t see the exact spot, so we continued to the second listed field figuring we could backtrack if needed. There was no need. As soon as we pulled up to the second field at the intersection of 57 and 140 (field was on 57, west of 140), we could see many plovers. Jumping out, I set up the scope and we had excellent looks at several birds. I snapped a few mediocre photos and we continued (it was starting to drizzle a bit). We continued on towards Laredo, making a quick stop to eat some of the food we had bought earlier. We reached Zacate Creek a little after 3PM. After moving to the closer parking lot, we began to explore a bit. Unfortunately, the Amazon Kingfisher had moved on (or somewhere else) but we did have a few good birds including feeding Osprey and Neotropic Cormorant, Great Kiskadees, and our only White-faced Ibis of the trip. 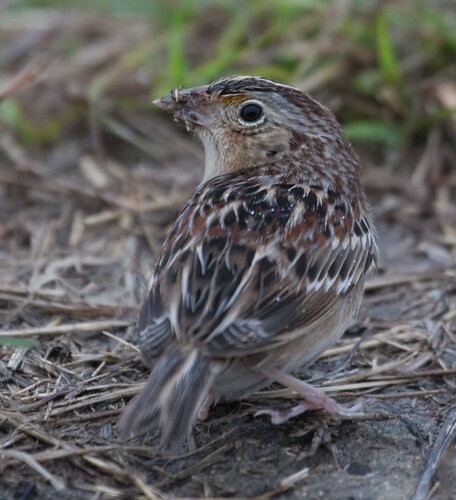 We spent a few minutes talking to some of the other birders (one born in Waltham(!)) 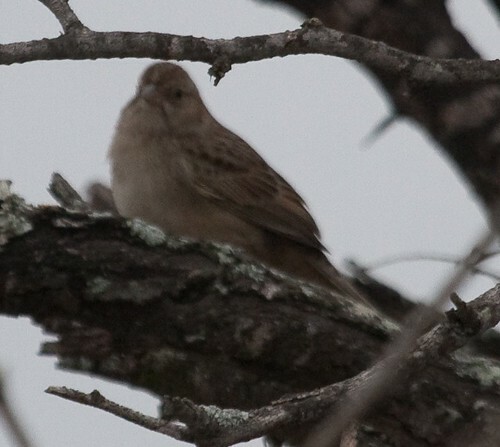 and got some good information on some of the birds down in the valley. 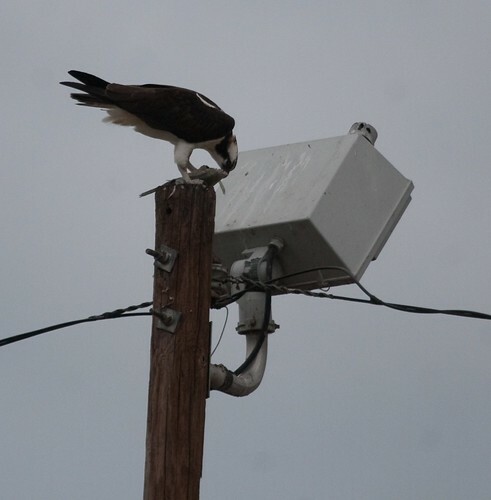 We also learned that the Roadside Hawk was no more but that a new one had been seen in Falcon State Park. Two Ringed Kingfishers flew overhead. They didn’t land but we still had good views. After an hour or so, we headed out to Zapata. We reached the Holiday Inn Express just about in time for kickoff (it was the Super Bowl) but had to run out to get subs for dinner. We saw some of the first half and the entire second half. The hotel seemed to have gone downhill from last year, with screaming kids audible for most of the night and just a general off feel. Tomorrow: Falcon, Salineno, Santa Ana.